Guess what? The HuntCave is haunted! This week, we open with a cool montage of bunker scenes with flickering lights, creepy noises, and the rush of a filmy chill that eventually forms into the friendliest ghost since Casper. Who is it, you might ask? Here’s a clue: he used to be in Advanced Placement. Awkward! Anyway, it appears Heaven is closed for business and Kevin is stuck in the veil. And it’s bad. Like, “DMV line times infinity bad.” Apparently it’s also crowded, and with nothing else to do, the spirits talk. Kevin has learned what we suspected all along. 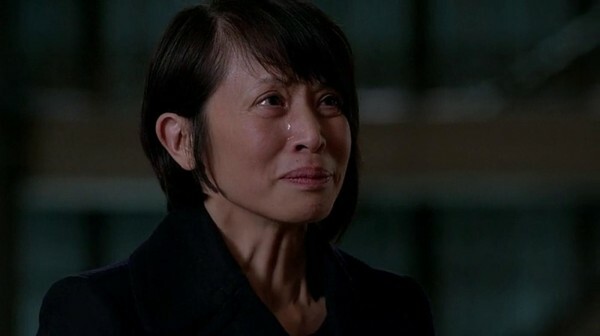 Linda Tran is alive. And he wants the Winchesters to find her. Castiel goes to the angel Rebecca’s vessel’s funeral, and speaks to Eliah, her former cohort. Rebecca was a former friend of Metratron and Naomi before becoming the leader of a new league of hippie angels, called the Penitents, who make love, not war. Unsurprisingly, they are not Bartholomew’s favorite glee club. Eliah is the last of the Penitents. Bart has killed the rest. Of course, Bart’s lackeys were watching the service, and they notice that Castiel is…well..Castiel, and they bring him to the boss. Bart? Surprisingly happy to see him. Apparently they used to work together, and Bart wants to ride again. Bart remembers this time fondly. Cas would, except, you know, rather than keeping angels captive during the battle between Cas and Raphael as he was supposed to do, Bart kind of tortured and murdered them. Now? Bart’s human allies? “Purged”. Bart makes it clear: you are with him or you are dead. The humans on his side? Buddy Boyle and his friends? All vessels now, unless they “went pop”. Despite this, Bart insists that he is Cas’ friend and he is free to go. Cas (and we) suspect otherwise. Ghost Kevin has acquired his intel from the spirit of someone who was either a stripper or the inspiration for a Barbie doll, and insists the boys look for her, prompting Sam to whine, “I’m still stuck on the fact that we’re trying to summon a ghost named Candy.” The boys bring various electronics, including the aforementioned percolator, to the spot where Candy died. As they wait, there is a bit of terse, punchy banter between the boys about Sam’s ghost shiver being from actual cold and Crowley ignoring Dean means that “maybe he’s just not that into you”. Finally? Candy makes contact. (Side note? Maybe she was a pop star–she prefers to communicate via radio.) It turns out Candy, who was the kept woman of a powerful Congressman, was one of three captives kept in a storage unit, and the other two included Linda Tran. Candy describes the main captor as “British, kind of short, loved hearing himself talk?” “Crowley,” Sam says, irritated. There is also another captor, ominously called, “the other guy.” Candy managed to escape, but was hunted down by the other guy and killed. But the last she saw? Linda Tran was alive. Unfortunately, the way she says it leads the boys to believe that that may not be a good thing. The Angel Bart, it turns out, is interested in the unification of the angels, except that his plan is less like the USA and more like Nazi Germany. Bart been destroying uncooperative factions and absorbing the others, all the while tracking Metatron to get the key to Heaven’s locked door. 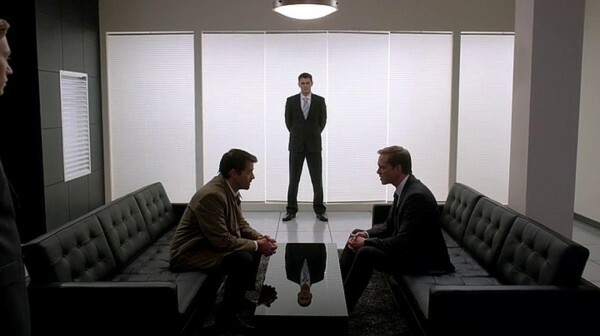 He sees himself and Cas as “the new boss and the ultimate rebel working together”. 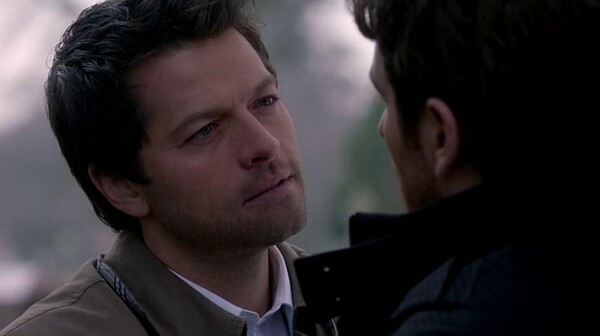 He formally introduces Cas to the way he works by torturing Eliah until he realizes he has nothing to offer. 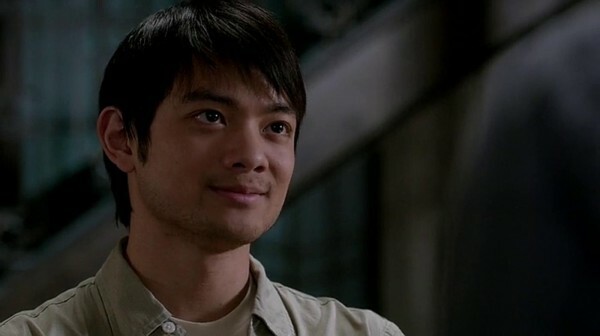 He then demands that Cas kill Eliah as a show of solidarity. Cas says he is no murderer. Bart reminds Cas of how many he has already cut down–how he killed an angel to steal its grace. “Who I was–what I did–is not who I am!” Cas insists, finally realizing he, too, is Bart’s captive unless he follows orders. Cas offers to let Bart kill him. 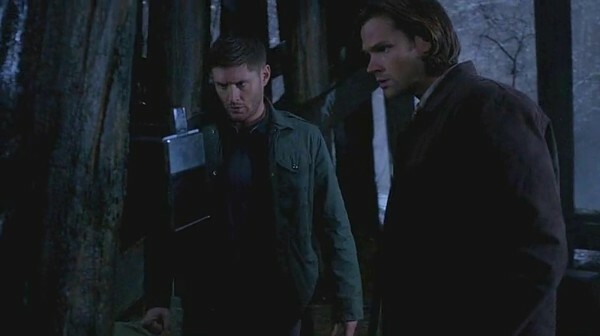 Of course, Bart uses Cas’ blade to kill Eliah instead. Linda Tran is a jill of all trades. For example? She knows how to cut the wiring on an electronic lock, thanks to helping Kevin with his engineering assignments (a mental picture that has me nearly breaking down with sorrow.) At first, Sam deftly avoids telling her about Kevin’s untimely end, his pain and guilt coloring every expression she does not see. The adoring smile on her face when she tells Sam that once they get the door open he will bring her to see her son slaughters Sam where he stands, and he gently takes her hand. “Listen…Mrs. Tran…” Sam manages to say before falling silent. His horrible expression tells her everything she needs to know. She swallows hard, broken for a moment, and says firmly, “You will take me to my son.” She then demands Sam man the flashlight as she works, fiercely determined, showing the iron fist that resides in the worn and disintegrating velvet glove. Cas sees promise in working with Bart. But he also won’t kill the innocent and he won’t work with someone who does. Cas won’t even throw a punch. “Angels fighting angels has to stop somewhere. It might as well stop with me,” he says. When Bart, infuriated, attacks, Cas manages to get him under his blade, but refuses to kill him when he has the chance. Of course, after a bit of monologuing, Bart takes his shot, and ends up being killed by Cas in self-defense. Funnily, it turns out? Bart was right. 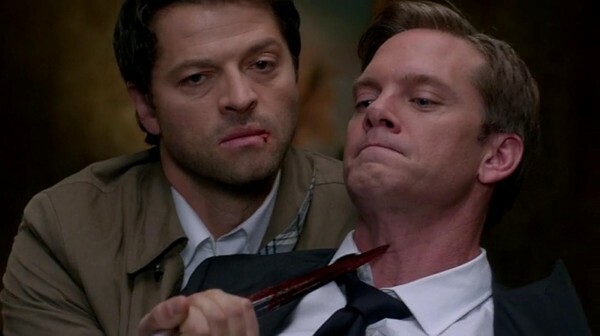 Killing someone is exactly the kind of thing Cas needed to do to impress the throng. Now Bart’s followers have their new leader. If Cas is brave enough to take the job. Back at the bunker, the boys tell a relieved Kevin that Linda is alive. She’s okay. “Does she know?” he asks, and we hear a broken Linda say, softly, “Kevin?” (Cue my tears. Again.) Linda is at once elated and destroyed, seeing him. “Hello, son,” she says softly. “Hey, mom,” he replies, and I am weeping like a child. Dean gives Linda Kevin’s things. His hunter’s tools. His books. The results of his perfect SAT score. The picture of the two of them he always carried. Apparently, Kevin’s dad died when he was a baby and left him a ring, now an object, like Bobby’s flask, that has the power to tie him to the world. Dean tries to warn Linda: there are risks to taking Kevin home with her. “He’s my son,” she says. “It’s my job to keep him safe. 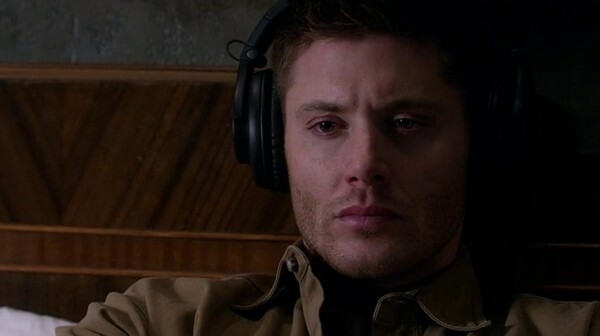 For as long as I can.” Oh, Supernatural. You have broken my heart before. Thanks for bulldozing it this week. And then backing up and running it over again. So. Much. ANGST! Painful reunions and lack thereof are totally breaking my heart. Luckily, next week we’ll get a bit of comic relief as we all, sing it with me now, “Face the ghosts when the others will not! (‘Cause) We’re GHOST! GHOSTFACERS!” That’s right, friends. Harry Spangler and Ed Zeddmore, the longest living recurring characters in the Supernatural verse, are back. 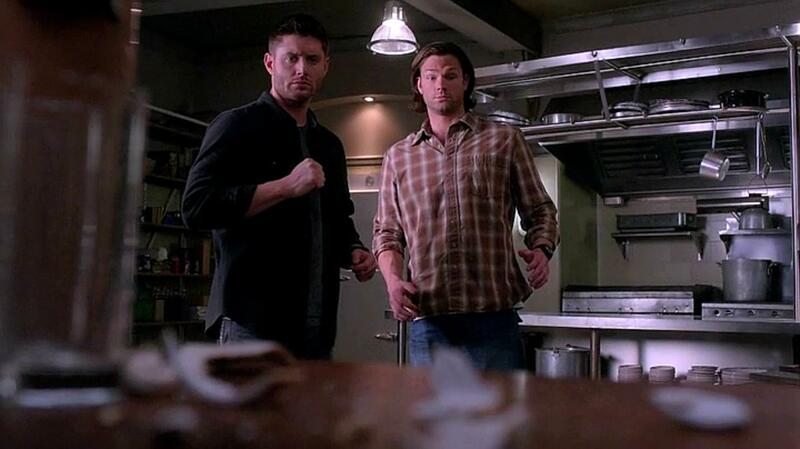 Undoubtedly, to totally screw things up for the Winchesters. I, for one, can’t wait to see how. Just a short note to thank you. Love your website and reviews. They always make my day! SO excited about Ghost Facers – over the moon excited. I love those guys. My issue with this episode came yesterday… I’m rewatching the series for the 5th time, yeah you read that right…. 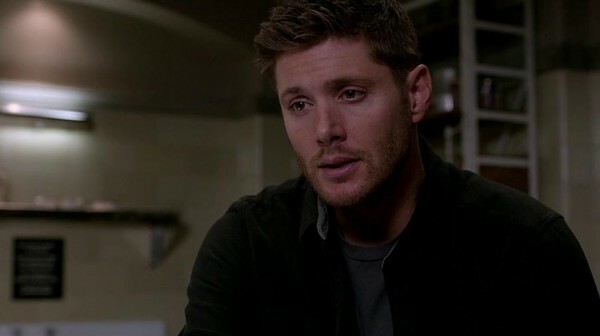 and I’m on Season 3 – Dean has given his soul over to the cross roads demon and he’s going to hell in 1 year. 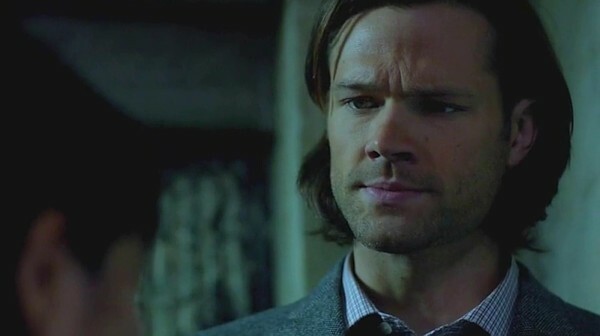 All the arguments and issues are exactly the same as this season and yet Sam can’t understand why Dean is so upset with him wanting to end it all. Just drives me batty, but that’s the point right? They always have to have moments when they don’t see eye to eye. PS – Um when are we all going to discuss the fact that there were 3 prisoners. Candy, Tiger Mom and a third… no one looked to see who the third person was!!!?!?!? !